Sheguiandah, Manitoulin Island, Ontario, P0P 1W0. Escape and Discover an area perfect for an enriching camping experience. Safe, clean and fun. Family Camping at it’s best on Manitoulin Island! To provide exceptional customer service in a friendly, clean and fun family campground, while creating family memories to last a lifetime. Manitoulin Island is the largest freshwater island in the world and has the most spectacular natural scenery providing something for everyone. Batman’s Cottages and Campground was founded by Ralph Batman in 1969. Batman’s started as a family operated campground and continues to this date as a family operated campground. Andre and Lisa purchased in 2008. 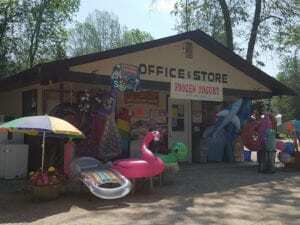 We have a main sandy beach known as Sunset Beach, with beautiful sunsets, a swim up dock with a gradual entry into the clear, refreshing waters of Sheguiandah Bay, Lake Huron. 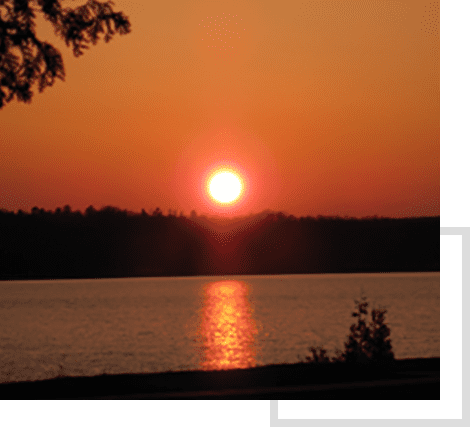 Sunrise waterfront is a natural lakefront setting offering breathtaking views of the sunrises, the La Cloche Mountains and a shallow swimming area in a natural lake setting with no groomed beach. Our Pull Through sites are located on this side and the main swimming area and beach is located on the groomed Sunset beach side. Bring your own boat, rent one of ours or fish off of our pier. 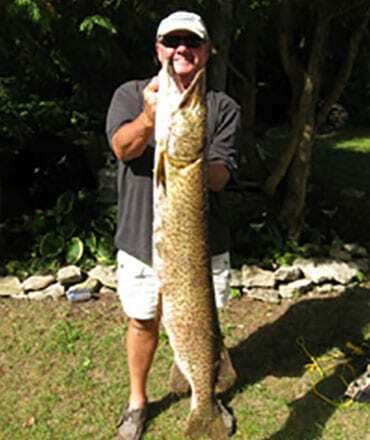 Guests of all ages have fun trying to catch that “big one”. 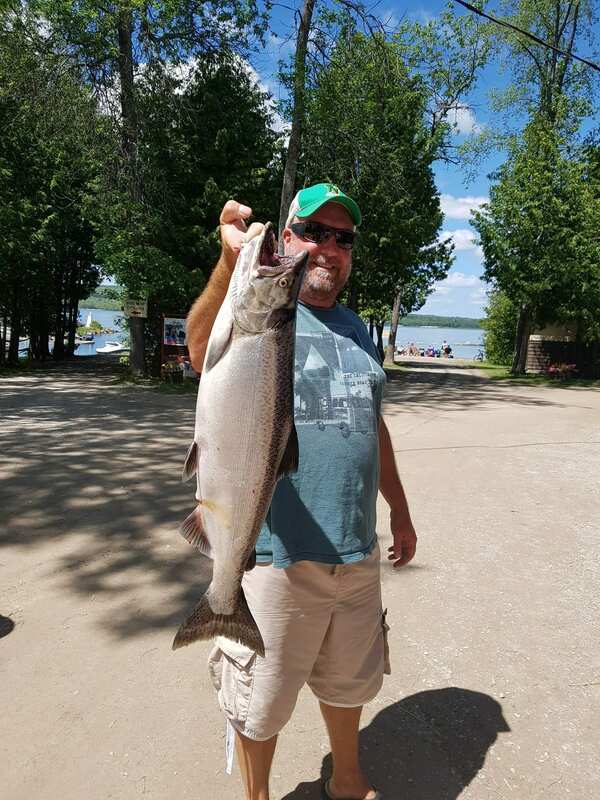 The species available are; Musky, Northern Pike, Perch, Salmon, Rainbow Trout, Lake Trout, Pickerel, Bass. To help you out we sell live bait. Yes, cell phones will work here! Guests love to bike on the level roads of our property or take a stroll on our Hiking Trail and enjoy nature. Listen to the enchanting call of the Loon, while relaxing on our sandy beach or paddle a canoe out on the lake. Gaze up at the skies and see millions of stars while you capture memories around your campfire. Enjoy staying in one of our 4 cottages or 142 trailer/tenting sites on 74 acres of private property. FULL SERVICED SITES with hydro, water and sewer hook-up. Most sites offer grass, mature trees, space and privacy from one another. Wide streets make it easy for trailer maneuvering. Our washrooms provide comfort with flushable toilets and lots of hot water for your shower. © 2019, Batman's Cottages and Campground. All Rights Reserved.